Some burger spots will feature the occasional out-there burger—a triple patty here, a dollop of guacamole there—but Philadelphia’s PYT has been making a business out of crazy burgers since 2009. Not only does the everyday menu feature over-the-top creations like the Pu Pu Party Platter (a giant bacon cheeseburger quesadilla that can feed four to six people) or the Doh! Nut (a cheeseburger topped with chocolate-covered bacon on a glazed doughnut bun), but they also come up with some mean limited-edition specials. In honor of #FWSummer bringing hot dogs, burgers and strong, icy drinks to Food & Wine’s Instagram this week, here’s a look at PYT’s greatest, wonderfully weird and possibly dangerous to eat burger creations. A crispy fried chicken patty topped with pimento cheese, lettuce, tomato, pickled green tomatoes and a fried wonton filled with PBR—think of it as a hot, crunchy, boozy Gusher. PYT is a master of bun-replacement. 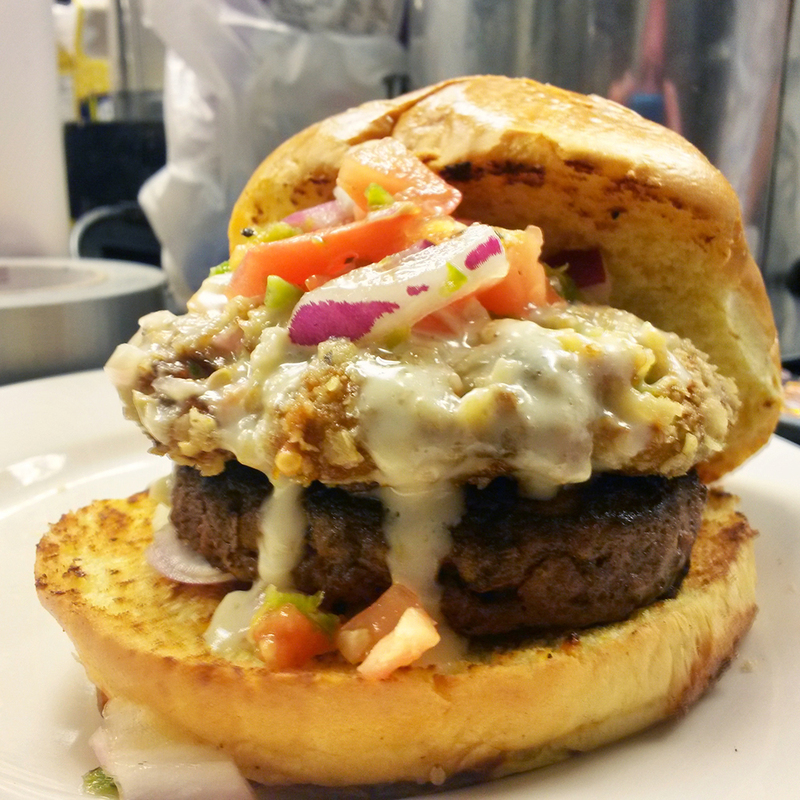 For this knife-and-fork burger they sandwiched Salisbury steak, carrots, peas, onions and a healthy dose of gravy between two deep-fried mashed potato cakes. When PYT first announced this burger on their Facebook page they did so with an apology: “We are really sorry about this, but someone had to do it,” they wrote. It’s a pork belly patty topped with American cheese and bacon, sandwiched between two deep-fried Twinkies. Frozen pizza brand Ellio’s—known for its rectangular pizza—was the inspiration for this masterpiece. Cooks at PYT breaded two slices of the pizza, deep-fried them and used them as buns to sandwich a giant smashed meatball patty topped with mozzarella, provolone and marinara sauce. PYT’s response to NYC’s ramen burger craze was the Spaghetti Burger: a mozzarella-stuffed meatball topped with marinara, smashed between two crispy, garlicky spaghetti buns. You would never know this was a burger by looking at it, but the Lasagna-Bun Burger does qualify. It is a beef patty seasoned like a meatball, topped with provolone and marinara, sandwiched between two deep-fried slices of ricotta-and-mozzarella lasagna. If you order your burger protein style at In-N-Out, you will get a burger wrapped in crisp green lettuce instead of a bun. At PYT, the only thing that qualifies as protein style is the Bacon Bun Double Cheeseburger: a double cheeseburger sandwiched between two round-ish slabs of tangled, crispy bacon. The guacamole that tops this chipotle–rubbed beef patty isn’t just fried. First, it’s rolled in crushed lime Tostitos. The burger is also adorned with salsa and gooey queso. An annual special at PYT, the Thanksgiving Dinner Burger is made up of a deep-fried turkey leg meat patty, mashed potatoes, bacon stuffing and cranberry spread on a pumpkin bun. It’s served with a side of hot gravy for dipping, pouring or taking like a shot. This one is for the fat kid in all of us. It is a five-ounce beef patty glazed with banana-Sriracha sauce, topped with applewood-smoked bacon and sandwiched between two peanut butter and jelly sandwiches that have been coated in a sweet batter, rolled in kettle chips and deep fried.